Free off-street parking. Sleeping 4 to 6. 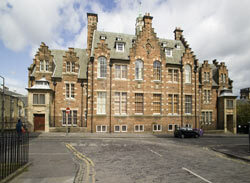 Drummond House used to be a school but has now been converted to modern apartments. 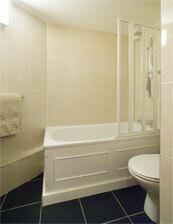 You can see the tall arched window of Flat 40 to the left of the middle of the photograph (right). 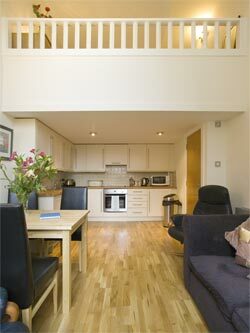 This is an exciting and central place to stay. A couple of hundred yards away is one of Scotland's finest buildings: the monumental entrance and quadrangle of Edinburgh University Old College by Robert Adam and William Playfair. The Royal Museum of Scotland is a little further on. 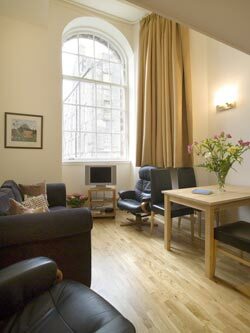 It is close to the Royal Mile and Festival Theatre and all parts of the city centre are accesible on foot. 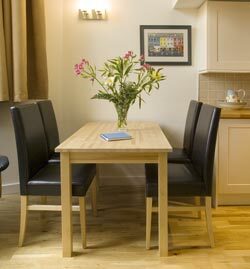 The area has book shops, music shops and plenty of restaurants, cafés and bars and also multi-cultural specialist food shops - for extra spice in your Edinburgh self-catering experience. 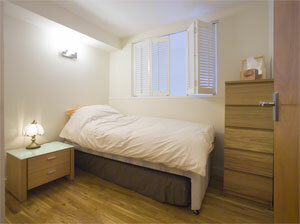 The apartment sleeps 4 plus 2 and has two bathrooms - and free private secure off-street parking. Sitting Room. Sofa, chairs, dining table, flat screen TV, DVD, Hi-Fi. 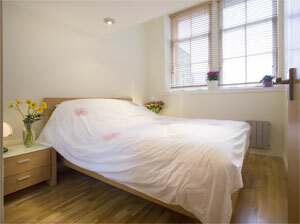 Below right; ...a further bedroom with single bed (which can pull out to make a double). 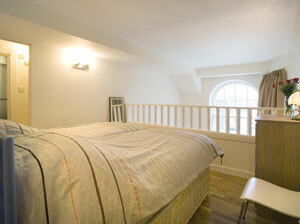 This bedroom is on the mezzanine floor above the Double Bedroom (above), and the internal louver window opens into the upper part of the Double Bedroom. Prices include beds made for your arrival, towels, electricity, heating, internet connection, Sky TV and parking for one car. Last minute enquiries are welcome. Weekends and shorter date-spans available. Please phone or e-mail. 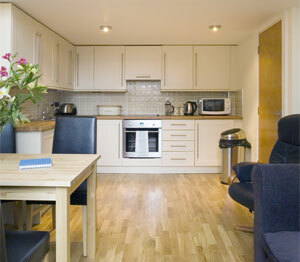 The apartment is usually rented by the week, normally from Saturday to Saturday. Please tell Maggie and Archie you found Flat 40 Drummond House through About Scotland! Porteous' Pend, sleeping 2 to 4.